The bridge on which I’m standing has been open for three years and yet this is the first time I’m walking along it. I need to get out more before I stop recognising my city. My problem is to decide what to call it in English. 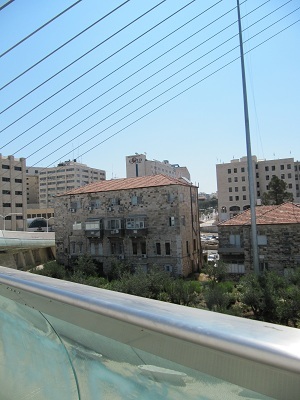 In Hebrew, it’s called Gesher Hameitarim – The String Bridge. But that’s string as in a violin string. Online, I find two options: The Bridge of Strings or The Chord Bridge. I like the way “chord” combines music and geometry. As I stand at the top of the bridge watching the changing view, people pass me, alone or in couples, quiet or chatting, on foot or on cycle. They don’t seem to notice the view. They’re probably used to it. Eventually I leave the bridge and follow the tramlines along Jaffa Road. There are plenty of stops for the tram or light railway, all empty because the opening of the light railway has been postponed yet again. Ghost trams pass by, their seats still covered with plastic, their destinations flashing alternately in Hebrew, English and Arabic. I sit down at one of the stops, providing it with some company for a few minutes. Buses have been rerouted away from here and it would be quiet if it weren’t for the drilling across the road. An old man approaches. “Is this hat yours?” He fishes a sun hat from under my seat with his walking stick and takes it with him. The market is crowded, even though it’s only Tuesday. People are busy rushing everywhere. 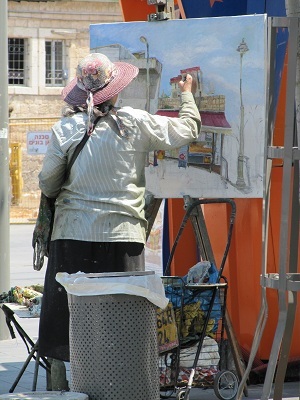 In the middle of it all, an old woman is standing in stained clothes and a straw hat. Next to her is an old shopping trolley filled with plastic bags. A bag lady, I think, until I go round to the other side of her and see what she’s up to. Yes, I definitely need to get out more. Great post, Miriam! I love how you capture the atmosphere. I don’t know why but I had you living in the north of England in my mind – even though your name indicates and Israeli connection. Btw, what was the promised announce,ent that never cam e tomorrow? And also btw – I think I know that artist in your photo. Actually, my husband is also from England and the name is almost irrelevant to where I am. And you needed to click on the link to read my guest post: http://bahtocancer.com/2011/07/guest-blogger-miriam-drori-my-pet-fox/. This post gave me inspiration for an activity that can be done in pairs or even small groups. Walk together in some place, observe what’s going on, take pictures, talk, drink a coffee, etc. and then blog about it and compare how each particpant captured the atmosphere differently, through their own personal filters.